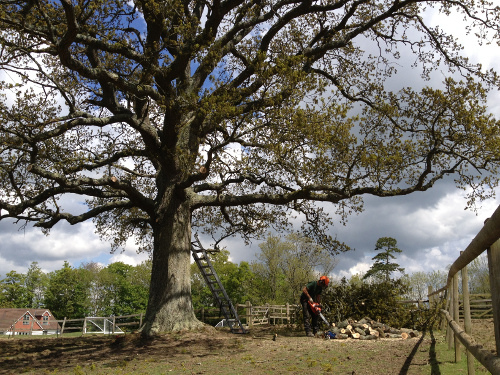 We are a family run Tree Surgery and Gardening business based in Horsted Keynes, West Sussex. We have been in business since 1996 in which time we have thrived as a business due to our reliability, high work standard and attention to detail. Greyhound have many long term customers in the Mid Sussex and West Sussex area around East Grinstead, Haywards Heath, Crawley, Horley and Burgess Hill. You will frequently find us further afield in Epsom, Reigate, Tunbridge Wells, Heathfield and Horsham. We offer a range of services which are always implemented with care and precision. We offer our clients our knowledge, judgement and thoughts on a one to one basis with a friendly manner and approach. Our business is run by partners Deborah Lewis & Duncan Baker, and son Lloyd Jerrey. We have a combined experience of nearly 40 years and a range of qualifications ranging from National Proficiency Training Council tickets to National Diplomas in Horticulture. Our public Liability insurance ranges from our basic £5 million cover to £10 million cover depending on the job and specification. Our consistency of high standard work has allowed us to be part of West Sussex Buy With Confidence scheme which selects and offers reputable traders in the West Sussex area. We offer a wide range of services which can be decided on by a free, no obligation quotation where we can share with you our knowledge and passion for the work. Our work ranges from private and domestic to commercial and residential and our work waste is disposed of using several different environmentally sustainable methods utilising as much as we can for recycling and reuse. Greyhound Tree & Garden services offer a large array of services ranging from grass cutting to large tree dismantles. We have the equipment, ability and experience to perform these services to a safe and very high work standard. We have a strict Health & Safety policy that we will always adhere to. Here is a list of Services we offer split into two sections to complement both the Gardening and Tree surgery aspect of our business. If you have a query regarding a service not listed or just want to discuss and understand the best service that would suit you, please do not hesitate to call and discuss with us what you would like and we would be happy to provide some non-biased, friendly advice. If your garden needs attention, call us now on 01825 791979. We will be pleased to hear from you.